This painting has an S-shaped composition which allowed van Dyck to add as much detail as possible to his signature large figures. 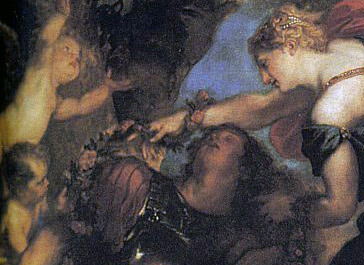 Armida is the central subject here, as van Dyck emphasizes the mystery and passion of the sorceress as she put the unsuspecting Knight under her spell. Various elements also help to direct our gaze towards the focus, Armida. Naturally, we are initially drawn to her billowing red cloak. 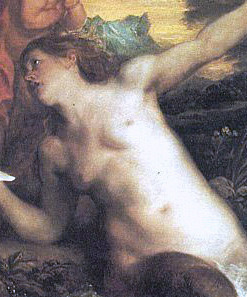 Next, the serenading Nymph's body extends toward her, further accentuated by the curious Cupid who also looks on to the distance and emphasizes Armida's bold presence. 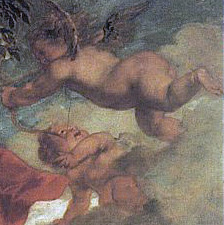 Armida's arched body faces the sleeping Rinaldo and his shoulders lead us to the two cherubs. Their bodies direct the viewer's gaze to the nearby tree whose branches lead the eye back to Armida. Furthermore, the two flying cherubs about to strike the lovers also redirect the eye to Armida. The color palette used in this work was full of very soft hues. Yellow and gold dominate the canvas and portray the idyllic, hazy atmosphere of passion and love between the sorceress and sleeping knight. The most striking feature is Armida's billowing red cape against the setting sun. Van Dyck uses various deep and soft reds to define its texture and movement as it folds and blows in the breeze. The red also dramatizes the lustful sorceress' state of mind and adds a feeling of eroticism to this piece. Red is also used to depict the flying cherubs above Armida, who also serve to represent passion. Red is also used for the flesh tints and to define shadow upon the skin. Rinaldo, the sleeping knight, is painted with soft, golden hues. He is under the spell of the sorceress and therefore his state of mind is rather hazy. 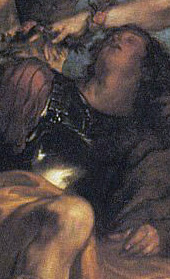 His trousers are evidence of van Dyck's ability to create reflective textures and this technique also shows the shadows and folds within the waning light conditions. The same technique is used for the knights' armor plate. The foliage is painted with browns and with dark over coating to define the shape of the leaves. The greens used here take on a more olive tone and are used in the flower wreath around Rinaldo's head. Armida's dress is painted in stark black tones and the artist uses grey to accentuate the numerous folds and thickness of the cloth upon her. Deep black is used for the numerous folds upon the sleeves and to accentuate the softness of the material. 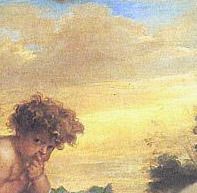 Van Dyck uses blue excessively for the partially clear sky and for the mountain in the background. He cleverly uses the blue so that it shows to be intensified in the sunlight as it sets to the right half of the scene. The blue furthest away from the sun between the trees and the overriding grey clouds, takes on a darker tone that resembles mauve. Van Dyck's clouds contain several light brown tones in the grey with strips of yellow interlaced to define the golden, setting sun. Clear white undercoating is used for the water Nymph's cold body and can also be seen in the clouds, flower petals and glint in the knight's armor plate which is also mixed with soft yellow. In Rinaldo and Armida the plane is once again on a slanted position from right to left. As the slant rises to the left, the right hand side gives the illusion of being in the distance and largely depicts the landscape. This technique helped create space and correct positioning so that the subject matter would be in exact proportion. Thus, this work shows van Dyck continuing with the Flemish style of landscape painting in creating a psychological rendering of the narrative taking place. The S-shape arrangement helps to ensure movement in the image and allows the light to play intricately in between the characters. It also allows the artist to position his characters on various planes, creating depth and three-dimensionality.